press roof tiles that are made from modern materials which are highly durable and finished with a stone-chip coating. These tiles use top quality steel that is galvanised with zinc, aluminium and magnesium (the ZAM compound). It was the use of steel in the process that allows the Metrotile roof tile to step above the competition. That’s because it can be pressed much thinner than slate or clay tiles while weighing just one-seventh of what these traditional materials weigh. The result is a roofing material that is secure, strong, weather resistant and doesn’t need a heavy-duty roof frame to support it. Each Metrotile profile is made with at least 25% recycled materials. The tiles are made in a facility in Belgium that works to the ISO 14001 standard due to a revolutionary wastewater recycling system. And the lightweight nature of the tiles means that it has one-seventh the transport requirements of other roofing tiles. so if there comes a time when you no longer want them on your roof many years into the future, they can be completely recycled. 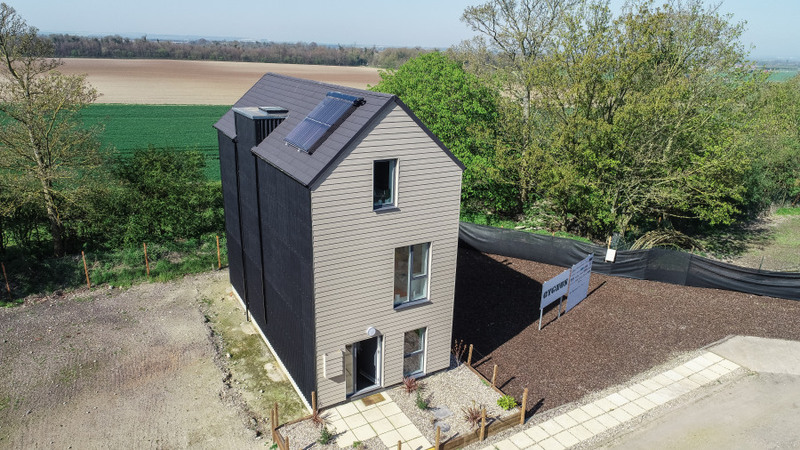 They are good to help insulate your property to reduce heat waste and cut down on utility bills and are a popular option with followers of Passive House approaches. s the best quality product. On the back of each tile,there’s an M.TEurope / made in Belgium printed alongside a QR code. And the reverse side always has a transparent coating that is silver, never black. What’s the outcome for a newly-pressed Metrotile? Once the products are made in Belgium they are then shipped to the UK where they are stored in our warehouse in Chippenham. Materials can then be sent around the UK to approved suppliers often by the very next day. Metrotile profiles are fully accredited by the British Board of Agrement and are, as a worldwide product, tested against extreme weather – from cyclical freeze-thaw conditions in Japan, to extreme wind uplift testing in California. And they’re light, making transport easy and cheap and reducing carbon footprint too. Specifiers working extreme locations around Britain and its territories are learning to rely on our products. Using Metrotile on the roof of your property means you get a protective layer that is weatherproof, guaranteed for 40 years and has the highest fire-resistant standard.You can be certain you have that high-quality finish that will protect your home or business for years to come, all from using genuine Metrotile products! So if you’re designing or building a project get in touch with the Metrotile team to find out how our lightweight tiles could benefit your project. Simply call us on 01249 658514 or you can use our contact form and we will get back to you.